The slogan of the value-added social network Cimjoy is 'Smart and joyful e-World'. Identification. A good slogan must stay consistent with your brand name either obviously stated or strongly implied. It should uniquely describe your brand and its purpose. Customer care. Show that you are → passionate about your customers, explain your dedication to your customers. and make clear your commitment to creating the → best customer value possible. Mass appeal. First → think of your audience and their needs and hopes, and then craft a remarkable and inspiring phrase that is appealing to the heart, connects with customers and keeps them thinking of your business. Valid. 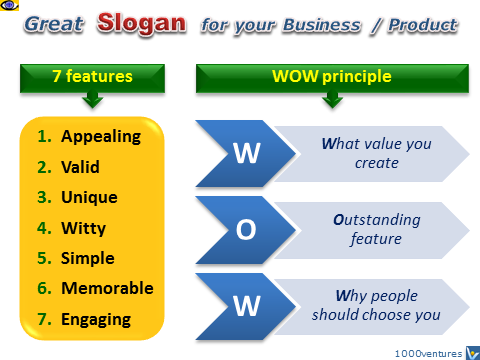 Your slogan must accurately reflect your business, product or service. Look at what your brand represents, what should draw people to choose you. Beneficial. Highlight a key benefit. Reveal your purpose and → benefits of the product by conveying the message in consumer language. Suggest the risk of not using your product. → Solve a problem. Create a positive feeling for the consumers. Witty. An inspiring and sharp wit can entice interest and give the impression that you company thinks more clearly, intelligently and creatively about it’s brand and value creation than others. Simplicity. Keep it simple. Use as few words as possible. Use sharp words and short keywords. Memorable. Use catchy words and phrases to make your slogan instantly recognizable and memorable. Your product will also be remembered if you displays a sense of humor in your advertising. Great slogans are so memorable that some become catch phrases in their own right.